Ph.D. from Regional Medical Research Centre (ICMR), Bhubaneshwar. Dr. Sangita Mukhopadhyay received her Ph.D from the Regional Medical Research Centre (ICMR), Bhubaneswar, India. As a graduate student, she worked on immunoregulation in filariasis. She demonstrated that the mode of action of the antifiilarial drug DEC was antibody dependent. DEC cross reacted with one of the filarial glycoprotein. A monoclonal antibody developed against this glycoprotein was found to cross react with DEC, build up a high local concentration of the drug around the parasite to bring about parasite clearance in Mastomys coucha. Later on, as a post-doctoral fellow at the National Institute of immunology, she worked on basic immunology where she demonstrated that the brutons tyrosine kinase (Btk) enzyme affects macrophage effector-APC functions. The Btk was shown to regulate iNOS/NO signaling and there is a cross-talk exists between NO and IL-12. She has also worked on allergen immunology where it has been shown that the delivery of allergen via the scavenger receptors could skew immune response towards Th1 phenotype. Her current research interest is Mycobacterium tuberculosis immunology where she is investigating how various putative virulent proteins help the bacillus in establishing successful infection by counteracting the protective immune responses mounted by the host. Before joining CDFD, she had a brief stint as a staff scientist at the Central Drug Research Institute, Lucknow, India. National Scholarship from Ministry of Education, Govt of India, 1988- 1989. Gold medal in M.Sc. in 1992. Apeeza Trust Award by Indian Immunology Society, India; 1996. Best Young Scientist Award by Indian Immunology Society, India; 1997. Best poster award by `Indian Immunology Society & Symposium on Immunoparasitology', India; 2002. 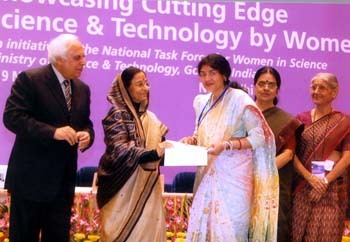 Young Women Bioscientists of Promise Award by Indian Science Congress Association, India; 2004. DBT Overseas Associateship Award by DBT, India; 2005. Membership of American Society of Hematology (ASH), USA, 2007 . till date. National Young Woman Bioscientist Award, 2007 by DBT, Govt of India.National Bioscience Award for Career Development for the year 2008. by Department of Biotechnology (DBT), Govt of India. Elected member of American Association of Immunologists, USA, 2010. Fellow of .The National Academy of Sciences, India, 2010. Fellow of The National Academy of Sciences, India (NASI),Allahabad, India in 2010. Elected member of 'American Association of Immunologists (AAI)',USA, Member ID No: 00220439. Last updated on : Friday, 25th January, 2019.